We've got another miniature communicator without a keypad. This time it's Hewlett-Packard (HP) that couldn't resist the temptation to get its share of the pie. Quite experienced in this segment, the company didn't try to reinvent the wheel and just copied a successful communicator O2 XDA Atom. It's manufactured by an OEM/ODM manufacturer in Taiwan - Quanta Computer. The rw68xx sales are limited only to East Asia and China, to all appearances not to interfere with the hw69xx series of communicators with keypads. The rw68xx line is planned to include several various devices. But only HP iPAQ rw6828 is available so far. This communicator possesses most features in this series. The main competitors of this model are various devices based on HTC Prophet, E-Ten M600, and, strange as it may seem, O2 XDA Atom. The new product differs from the first group in its support for EDGE and the built-in FM tuner. The only difference from the O2 is its design, the other parameters are the same. But devices similar on paper may differ much in real life. 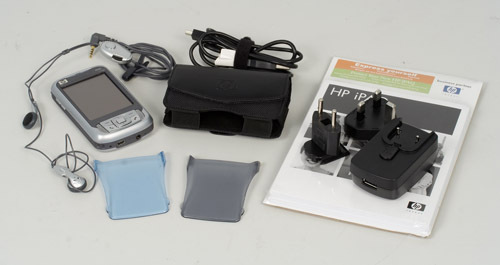 A small box (for an HP device) contains: a communicator, a battery, a stylus, a case, two protective lids, a headset, a charger, adapters for various sockets, a USB-miniUSB cable, various booklets and manuals. Plus a CD with software from Microsoft and HP. Not much, but everything necessary is included. There is only one USB cable, which has to do with an unusual design of the PSU. It contains a USB-compatible connector! And the communicator has a single miniUSB jack. Thus, the communicator is charged when you connect it with the bundled cable to the power supply unit. The same cable is used to connect the communicator to a desktop computer. This scheme has its pros and cons. Here are the pros: a single cable for all situations, interchangeable cables (e.g. from card readers), a standard jack on the communicator, you can charge other devices from this PSU as well. Cons: you cannot charge the communicator fast and sync it with a computer at the same time. In this case the device charges from USB, which is a tad slower than the usual procedure and not all computers can supply sufficient power. HP iPAQ rw6828 is a typical representative of candy-bar communicators without a keypad, which were made as miniature as possible (fancy a maxi-mini-skirt. - editor's note). The communicator qualifies for the handset and smartphone standards thanks to its smaller display. The device feels much lighter than the other models, despite its large battery. The communicator is of an unusual color for the current season - stylish silver-metallic and dark greys. The entire case is made of plastic, including the insert on the front panel that surrounds the display and a group of buttons, as well as a stiffening rib that goes through all end faces of the device. The combination of colors is very nice and certainly stylish. This material is not stained by fingers. If you open up the battery bay, you can see the true color of the plastic — usual matte grey. You may notice a paint borderline at the edge and its fine-grained texture. Most part of the front panel is taken by the display. The display is buried into the case and edged with a groove in the plastic, which makes it look larger than it really is. A protective screen will easily cover the gap between the display and the plastic (don't forget to remove the dust before you do it). A group of buttons and a four-way joystick is located under the front panel, rather far from the display. All the buttons are made from silvery plastic. The On, End, Contacts, and Message buttons are located to the left and to the right of the joystick. These buttons can be backlit. There is no room left for the iTask button (traditional for HP), the program itself is not included either. The size of the joystick and the central button makes it very difficult to move it left-right with a finger. Anyway, tactile feedback is distinct, you will hardly mistake a press. Two speakers, covered with metallic lids, are located on both sides of the buttons. Two status indicators of the communicator and its wireless interfaces are placed above the front panel. There is a speaker hole in the grey plastic plate that covers the indicators. A battery bay covered with a lid is located on the rear panel. You can also find there a built-in camera, a mirror, and a LED flash. There are mounting holes on the left and right sides of the communicator for the protective cover. The traditional cover for HP handhelds is improved. It only covers the display and the upper part of the front panel, leaving the buttons and the joystick open. The source of constant gripes in the previous HP models is repaired. The left side is used for the volume control buttons, which would have been convenient to use for scrolling. The right side houses camera and voice memo buttons. There is an IrDA window above them. The following elements are located on top: stylus bay, miniSD slot, and the power button. The stylus is of average size, thin and light-weight. The power button is not large and it's flush with the housing to avoid accidental presses. The bottom of the communicator is used to connect a cable to charge and sync the device. 2.5mm jack for a headset is located next to it. The bottom also houses: the reset button, a mike, and a hole for the strap. The most convenient way to carry the communicator is in the bundled belt holster. If the protective cover is installed, you'll have to remove it before you put the communicator in the holster, or it won't close. However, dimensions and weight of the communicator allow to carry it easily in any pocket or on a cord, risking to lose an expensive device. Design of the communicator is up to the mark — it features everything necessary and we've got no gripes with it. The device looks stylish and catchy. Unlike the glossy black O2 Atom, the silvery rw6828 appeals to the eye, though tastes differ. HP handhelds traditionally come with lots of useful programs. HP iPAQ rw6828 is not an exception. The first thing you notice is a lot of icons and buttons on the Today screen. It contains shortcuts to all necessary applications and settings. For example: wireless controls, brightness and battery indicators, player and radio. 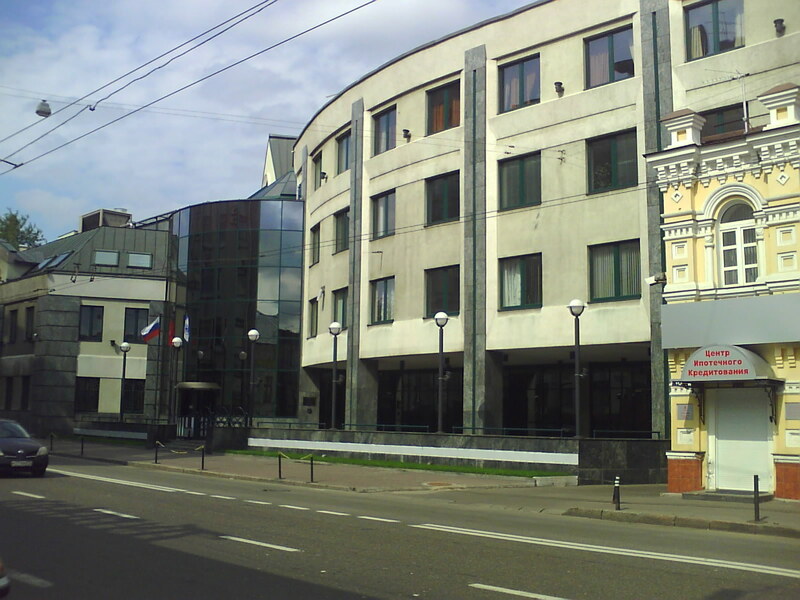 The following applications and utilities are installed in the system: Auto Configurator — automatic configuration of the communicator for a selected mobile operator (the three biggest operators in Moscow are available). FM Radio — this program controls the built-in radio tuner. Java — virtual machine for running java-midlets. HP Photosmart Camera — interface and program for the built-in camera. HP Photosmart Mobile — photo album, a replacement for the standard multimedia browser. Self Test — this utility tests functions of the communicator and its operating system. Voice Commander — voice control of the device. Wi-Fi — configuration and diagnostics of the cognominal wireless interface. The Settings group includes several preinstalled utilities. HP Asset Viewer — information about the operating system and hardware configuration of he communicator. iPAQ Audio — audio configuration of the device. Active Sync Mode — switches between sync modes of the device with a desktop computer. The rw6828 uses a 320x240 transflective TFT qVGA panel, 2.7" (68 mm). This panel supports 18-bit colors (262 thousand colors), but it can use only 64 thousand colors at a time. The size of the display makes separate pixels almost undistinguishable. The colors get inverted only under sharp viewing angles. Backlight brightness level varies from maximum to off. Display controls are limited to functions of the operating system. The protective cover reduces brightness of the display. It has no effect on reading. Nevertheless, the image looks much better and more saturated without it. The communicator comes with two covers of different colors and transparency. The communicator is equipped with two speakers. The phone speaker on top of the front panel is used for talking. The main speaker is on the bottom of the front panel, it consists of two parts. Stereo sound is provided by two speakers, but this effect is noticeable only at a small distance when a user stands right in the middle. The volume level is standard, it's enough to play ringtones. The communicator comes shipped with a standard wireline stereo headset. This accessory is equipped with a volume control and the call button. This headset and other types of headphones are plugged to the 2.5mm jack on the bottom. The iPAQ Audio application allows to configure low and high audio frequencies, 3D effect, as well as automatic control of the mike level. We checked the quality of the audio section of the communicator in RightMarkAnalyzer 5.5, having connected the device to the Terratec DMX 6fire line-in via the headphone jack. Test results are published in the following table. On the whole, the results are positive, no troughs. There exist handhelds both with better and worse characteristics. The rw6828 demonstrates an average level. It does not mean that it cannot be used for playing music. In most cases a user won't notice the difference. 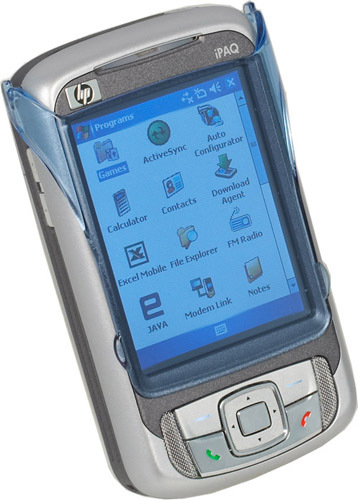 Like O2 Atom, HP iPAQ rw6828 is equipped with a built-in FM radio. Reception quality is just as bad. You can hear interferences already at 25 km from the radio source. 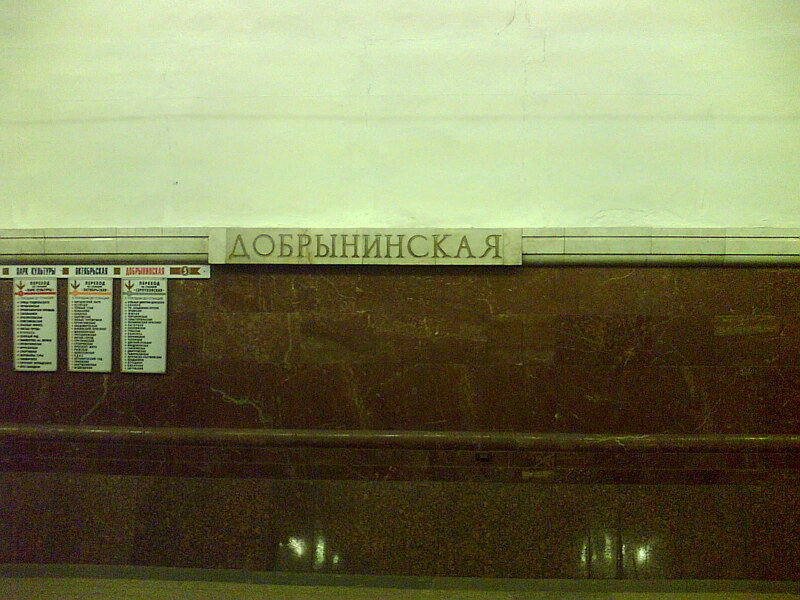 You can make something out in the open space, but it's impossible inside a building. Sony Ericsson k700 is beyond comparison here, it receives most stations on a decent level. We can come up only with one explanation here — deliberate reduction of the radio sensitivity in order to eliminate interferences from other components of the communicator. You can control the radio tuner with the FM Radio program. It has 55 slots for radio stations. I wonder how justified it is. Are there locations with so many radio stations? It allows to capture audio in WAV and GSM610 formats. Considering the low reception quality at long distances from the signal source, the option to make high quality records is purely virtual. 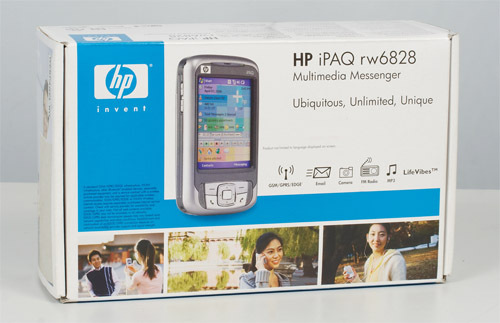 Here is the list of wireless interfaces in HP iPAQ rw6828: IrDA (SIR), Bluetooth v 1.2, Wi-Fi IEEE802.11b. The communicator has all modern wireless interfaces, even the ancient IrDA port is not forgotten. The front panel houses the corresponding interface indicators, they can be controlled via the Wireless Manager application. Most HP handhelds use Broadcom's stack to control Bluetooth module. It offers a more convenient interface and more functions than the standard one. We don't know the reasons to give up Broadcom's stack in the rw6828, Nevertheless, when you open Bluetooth settings, you'll see the standard WM 5.0 interface. Its basic functions are fully implemented, we had no problems with synchronizing with a desktop computer via Bluetooth. A situation with the Wi-Fi module is a tad better. Along with the standard tools of the operating system, Wi-Fi Utility provides additional settings. We have no gripes with the Wi-Fi, all settings are crystal-clear. The built-in camera features 2 Mp, CMOS matrix, F/2.8 lens (focal distance - 1.8 mm). Maximum resolution - 1600x1200. 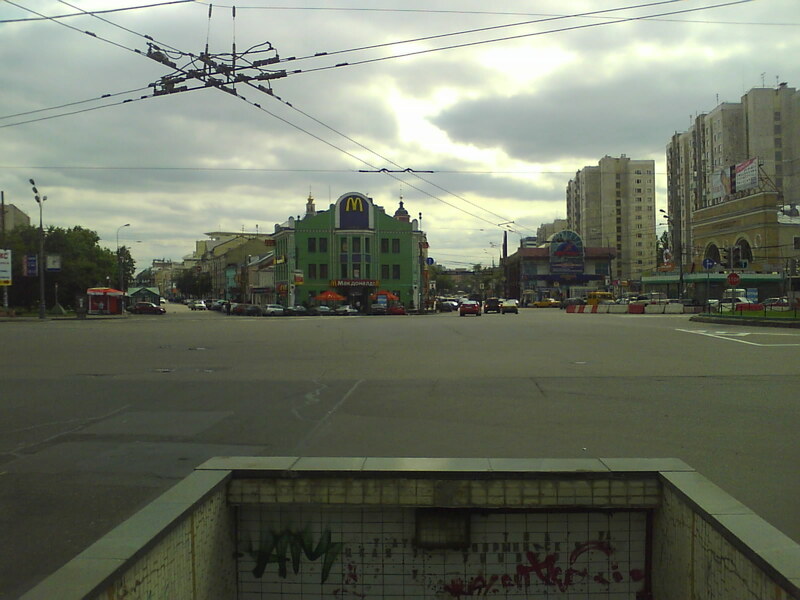 Photo format — JPEG. You can control the camera via the HP Photosmart Camera application, which is assigned to one of the buttons on the right side of the communicator. Video can be captured in 352x288 resolution, 3GP H.263 format only. Video length is limited only by the free memory. 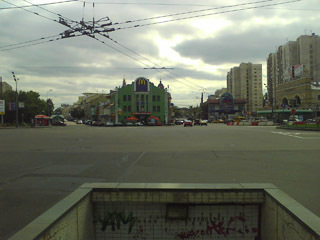 All photo settings are used for the video mode as well. Here is a sample video fragment. Photos are of low quality. In particular, we can note a high noise level in insufficient lighting conditions. Settings are buried deep in the menu, so you have to use a stylus and go through several dialogs each time. The main objective of this camera is to take photos and capture video for MMS messages or to lodge some event into memory in case of urgency. You cannot expect high-quality photos from this camera, even though it has lots of settings. According to the manufacturer, capacity of the built-in battery should be enough for 5.5 hours of continuous talking or 250 hours of standby. 1530 mAh should be enough. But the battery run-down time in a normal usage mode was just 131 hours. Here are battery life results for various applications: reading a book in Haali Reader with auto scrolling and 70% brightness — 9 hours, playing music in GSPlayer with switched off display — 11 hours, playing video in TCPMP (maximum brightness) — 1 hour 50 minutes, listening to FM radio — 9 hours 20 minutes. The minimal battery run-down time under maximum load was 1.5 hours - we enabled all wireless interfaces and played video via Wi-Fi. The device can be charged from a PSU as well as from a computer USB port. In the first case, the charge time is a tad less than 2 hours. In the second case there may be two options. Fast charge mode (specified in settings) — 3 hours, slow method — nearly 6 hours. HP iPAQ rw6828 demonstrates average battery life results even with a large battery, a tad lower than the results of other devices of this class. However, these results may be sufficient for many users. HP rw6828 is equipped with Intel XScale PXA272 416 MHz. It's an average-performance model in the line of ARM processors (from Intel so far, but in the nearest future — from Marvell). Spb Benchmark results are published below. 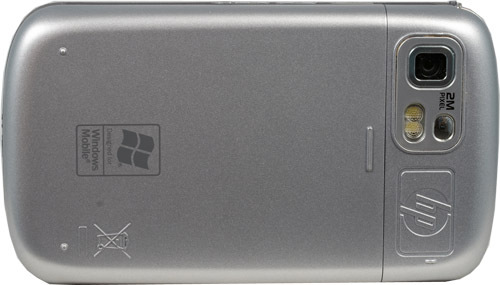 We also published the results of O2 Atom, E-ten M600+, and Dell Axim x51v for you to compare. The results are somewhat disappointing, iPAQ rw6828 is no different from O2 XDA Atom in most parameters. The HP model even ranks below its next of kin in some respects. Similar devices do not do well in the Word test, probably an error in the test. That was the reason why we couldn't make out the rank of the communicator's architecture. Memory stream performance and sync speed turned out very low. Playback speed of a test video fragment with the following parameters: 1.5 Mbit/s, 512x384, DivX codec in The Core Pocket Media Player (TCPMP) 0.71 was 68.7%. As in case of E-Ten M600+, that's the effect of the slow NAND memory of the communicator, which just cannot provide a necessary data stream. Considering the price for HP iPAQ rw6828, the device will hardly be widely spread. Like O2 XDA Atom, it's an image-class communicator for those people who love original things. The choice between these two models depends on personal preferences, as these communicators are identical in terms of hardware and their functions. 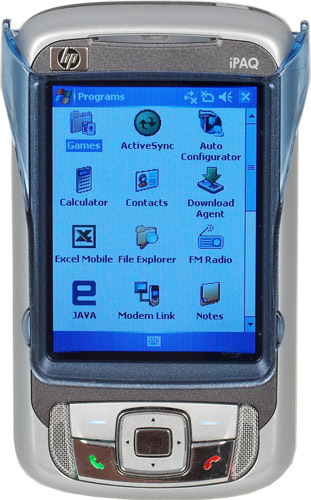 Unfortunately, all the problems of the O2 XDA Atom were adopted by HP iPAQ rw6828. It also possesses disadvantages, which are not typical of its competitors: a shorter battery life and relatively few preinstalled programs. Advantages of this model are in high-quality material and attractive design, small dimensions and weight. Besides, the new product is equipped with all kind of wireless interfaces and a built-in camera.